With the AVALANCHE GTR 650 EVO-R the chairman and founder Uwe Gemballa follows this success story and presents the face-lifted version of the current AVALANCHE-generation. Equipped with a spectacular automobile design and an auto body which has been broadened with Thyssen steel, the super sports car sets benchmarks for production quality and design vocabulary. But that is not enough: the AVALANCHE GTR 650 EVO-R offers elaborate, supreme technology and with 650 hp it delivers an enormous top speed of 332 km/h. Driving pleasure for highest demands. In addition to the breath-taking shape of the AVALACHE, the GEMBALLA engine department developed a powerful performance enhancement for the serial gearing. The engine makeover includes a racing crankshaft, a titanium connecting rod, forged pistons and racing turbo chargers. Camshafts and cylinder heads are mechanically fabricated in precision work. The aluminium induction pipe and a carbon air box with sports air filter provide the optimal air supply. A further makeover feature and responsible for the sporty and powerful sound of the AVALANCHE GTR 650 EVO-R is the stainless steel - high-performance exhaust system with the optimised racing headers. 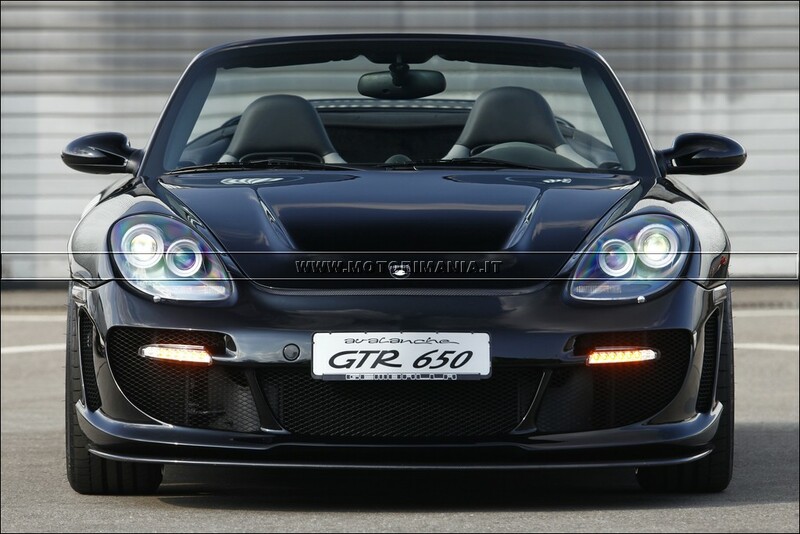 After the extensive modifications, the super sports car has 650 hp / 478 kW at 6.200 rpm and 950 NM at 4.600 rpm. Thereby, the 4WD automobile accelerates from 0 to 100 km/h in only 3.4 seconds and reaches a top speed of 332 km/h. And when this is not enough, the GEMBALLA-specialists offer even further engine types with performance enhancements up to 800 hp. Wheels and running gear - the combination for best road handling and a striking appearance The wheel/tyre combination of the AVALANCHE offers the optimal compromise between comfort and control. The multi-part and especially light aluminium wheels are delivered in size 9.0Jx20 with tyres measuring 245/30 ZR 20 for the front axle and 1.5Jx20 with 325/25 ZR 20 tyres at the rear axle. GEMBALLA completely re-designs the interior of the AVALANCHE and turns it into a VIP lounge with motor sports atmosphere. The serial lining is replaced by most precious leather. The GEMBALLA aluminium pedals splendidly shine in the foot well and perfectly go with the carbon fibre components of the interior set. The technical highlight is the full-size airbag sports steering wheel measuring 340 millimetres in diameter. The sports seats type POLE POSITION offer extra seating stability.